Few companies bridged that gap between the radio days and the television era the way that RCA did. RCA didn’t just develop cutting-edge radios and television sets, they developed broadcast technology that defined how generations of consumers would receive their media and how old people still continue to receive it today. All parties must end, though, and this 1984 dealer-only demo disc of RCA’s Selectavision line plays like the wilted final jabs of a once-great prize fighter just before the manager throws in the towel. Don’t get me wrong; there’s a lot to like here. For one, the set. It’s warm, tastefully glitzy, creepily plush, like a game show prize area. 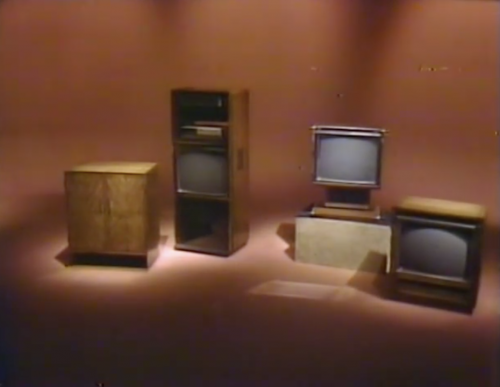 I’m a sucker for a darkened television set that selectively lights up for emphasis, a very 1970s-80s television tactic, and that effect is done repeatedly throughout this video. There’s also a showtune-y refrain at the end of each segment that grates on the ears but fits the time and place really well. The tech is also somewhat impressive. 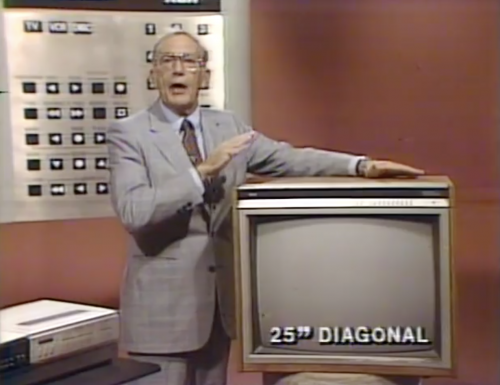 The Selectavision label wasn’t new to the ’80s – it had been used as far back as 1969 referring to the Holotape concept – nor was it specific to a device. 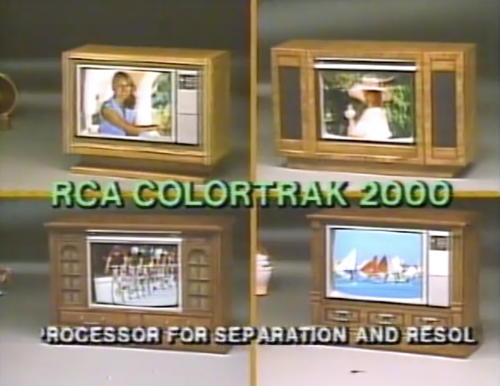 In this case, Selectavision applies to a convertable VCR, a range of monitors, and the CED disc player. The convertable VCR is legit groundbreaking, an impressive device with a rechargeable battery that clicks seamlessly out of its berth for on-the-go use with a video camera. The CED (Capacitance Electronic Disc) player, and really the technology as a whole, isn’t as impressive as RCA wants it to be. Not quite a record, not quite a LaserDisc, the CED lay somewhere in between. It’s an analog video disc that’s read by a stylus, an idea that may have had some merit when it was conceived in the ’60s but loses a bit of its futuristic luster when marketed on in a world on the verge of optically-read compact disc technology. Still, there’s something nice about the design of both the machine and the discs themselves, which were kept in goofy oversized cartridges that offered protection from dust. RCA does a hard sell here on the idea of technology and the titles that they’re offering, and you can sort of tell that they’re not even buying their own hype. This train has already left the station. RCA’s proprietary all-in-one remote is another impressive part of this demo, a universal remote before there were universal remotes. You can look at remote control efforts before this thing existed to see the kinds of options that consumers lacked up to that point, and also look forward to see just how far we’ve come with simplicity and connectivity. 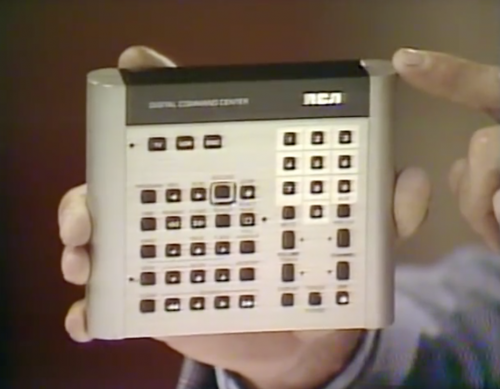 By 1984’s standards this is a pretty revolutionary remote, but it’s still a complicated mess – not to mention you’ve got to be thousands of dollars deep in RCA products to be able to get any real benefit from it. It’s still attractive, and by the way the demo keeps coming back to it it appears that they know it. In between all of this are the television sets. Here’s where you start to see the cracks in RCA’s armor. There’s nothing particularly wrong with the monitors, but there’s nothing particularly special about them either. This demo exists in an era where competition in the consumer electronic space is ratcheting way up and differentiation is key – either in feature or performance – and RCA can’t really boast a strong advantage in either. Also, there’s a TON of television models. There are points where it starts to feel like a game show prize rundown and a home shopping channel had a baby. 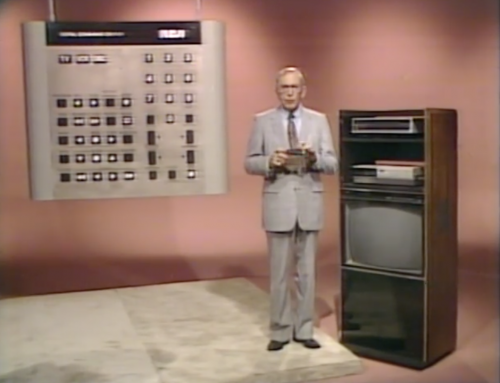 So at the end of it all you have some TVs that are fine, an already-outdated video disc technology that you’re trying to launch, a universal remote, and a VCR for a fringe audience that pops out and can be used with a camcorder. 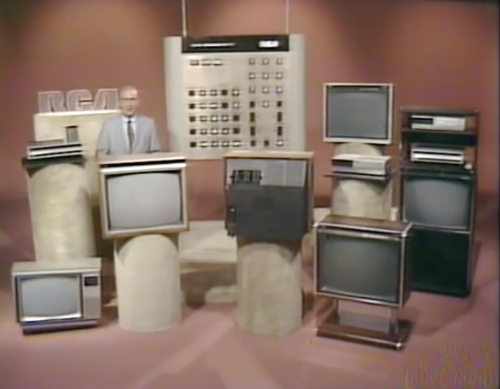 Not a good look for RCA, who would be bought by GE two years after this demo and essentially sold for parts. The brand survived but their golden era had come to a close. Here’s the video; keep an eye on the menu system and how clunky it was to even skip around the demo in this “groundbreaking” CED technology.